The end of a year is filled with so many things — holidays and family, goal-review and goal-setting, and decluttering (closets, desks and paperwork) so you can start your new year organized. While it can be challenging to get everything done, the end of a calendar year is also an ideal time to make sure your financial house is in order. 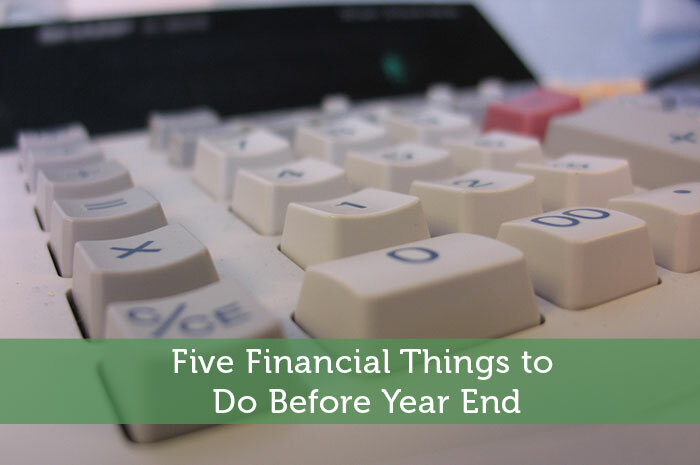 With as much discipline to your finances as you have to your other goals, here are five financial things you can do before year end. Plan ahead. Avoid last minute requests to banks and brokers to transfer securities prior to year-end. Most custodians required written instructions by early December to ensure transfers are processed prior to year-end. Every individual is entitled to make a gift up to $14,000 per year to any other individual(s) free of federal gift taxes, while a married couple can join together to make tax-free gifts of up to $28,000. In addition to these annual gifts, an unlimited gift tax exclusion is allowed for permissible educational and medical expenses; these payments must be made directly to the educational or medical institution. Consider how you would like to give back at the year’s end to family and friends. The holidays are a good time to consider contributions to charity. In addition to supporting a good cause, charitable giving is a great way to involve the whole family in a discussion about the importance of gratitude. Get your kids involved as you give back to charities. Talk to them about why giving to charities is important to you and why you selected a specific charity. Teaching your kids empathy and the importance of caring for others is an invaluable lesson and gift to give your kids. When your kids are already out in the world, it’s tough to go back and teach the value of giving. If you are planning to make charitable gifts, consider using appreciated securities whenever possible. How did the family finances work out this year? Get the new year off to a good start by being careful of spending during the holidays. If you have college students in your household, how are they doing with their own finances? The holidays are a good time for financial check-ups for the whole family. In fact, consider reviewing your family mission statement to see if you are on course with your financial plans. If you don’t have a mission statement for your finances, now is a good time to create one. A mission statement doesn’t have to be complicated. Come up with one sentence that describes your values and vision for your family. Openly discuss financial matters with your family members. Be sure you’ve made the maximum allowable contributions to tax-deferred retirement accounts. While the end of the year can be a busy time, make sure your finances don’t get left behind. By doing these five things, you can end your year on a strong note and use your momentum to begin the new year with your financial house in order. Author Bio: Linda Davis Taylor, author of The Business of Family: How to Stay Rich for Generations, is the CEO and Chairman of Clifford Swan Investment Counsel in Pasadena, California. A participant in a fourth generation family business, Linda is a frequent speaker on wealth transition, family governance, and philanthropy. In addition to her investment counsel career, she has had over twenty-five years experience in senior leadership positions at Emory University, Claremont McKenna College, Amherst College, and Scripps College. Lindahas served as a trustee for numerous educational and non-profit organizations and is a co-founder of a private foundation. She and her husband are the parents of two adult daughters. We have been doing a final review of our 2015 year and getting ourselves organized for 2016. The only other thing I would add to this list would be to get your 2016 budget and savings goals set so you can start on them right away in January!